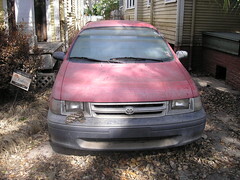 The car was completely submerged by the flood waters, and it disappeared at some point between October-December 2005 when we were in Nebraska. We of course assumed that it was removed by one of the companies hired to pick up flooded cars. So it seems unfair to me that I should have to pay the $15. Instead, I'm sending the Department of Public Safety and Corrections a letter asking them to charge the $15 bill to the Army Corps of Engineers.